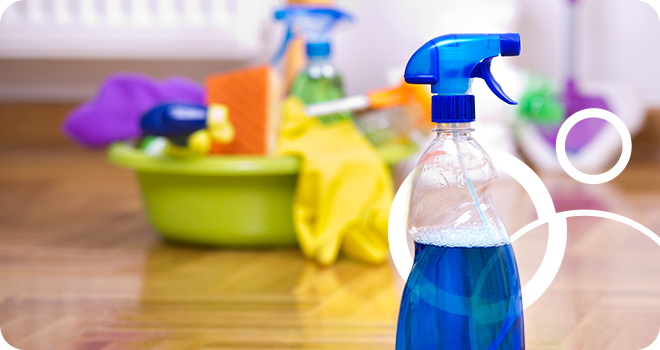 All-purpose spray and glass cleaner that is pH-balanced and capable of disinfecting (or at least sanitizing) surfaces. Floor cleaner that’s also a pH-balanced solution, billed as ‘safe for any finished floor surface,’ including wood; use also for baseboards and spot-cleaning walls. A lint-free cloth for buffing streaks from mirrors and other glass surfaces. Multicolored, nonabrasive cleaning pads (in lieu of sponges). NOTE: PROs use color-coding (green for kitchen, blue for bathroom, etc.) to avoid cross-contamination risks. Toilet bowl cleaner and dedicated brush. If using a single bowl brush across multiple bathrooms, select a design that properly contains the brush to prevent cross-contamination with other tools you may be carrying from room to room. High-quality microfiber cloths and/or an extendable microfiber duster. NOTE: PROs also prefer microfiber mop-head covers, which can be washed and reused many times, making them both economical and environmentally sustainable. Absorbent, waffle-weave towels for wiping/drying. Nylon-bristle brushes in a range of sizes for gently scrubbing and going into awkward nooks and crannies. A lint roller is an essential if you have fur babies in the house! It goes without saying that a high-quality vacuum with a range of useful attachments is also a must for keeping your home consistently clean (we’ll cover key vacuum-selection factors in a future post this year). A mildly abrasive cleaner. At least temporarily as you establish a more regular cleaning habit. Lime scale remover. A must if you live in an area with high mineral-content (hard) water. Soap-scum remover offers just the right chemistry to dissolve chemical bonds formed between common elements found in soaps and minerals such as calcium and magnesium found in hard water. Mold/mildew remover—or chlorine bleach as an alternative—to kill and contain these living, multiplying organisms. Wood soap. When wood is properly sealed—as virtually all contemporary wood floors, cabinets, and furniture items are—you might choose a specialty wood soap, but it’s also fine to use mild, all-purpose cleaners; polish is rarely (if ever) needed (except where severe etching is causing dullness). For untreated or antique woods, see this post for how to best maintain. Goo remover. especially if you’ve got sticker-loving kids or family members into glue-using crafts and hobbies, a good goo remover paired with a razor or plastic scraper can be your best friend. Baking soda is not just for baking and deodorizing; baking soda is a hero for cleaning ovens, cooktops, and burnt pots and pans and also a key player in emergency stain treatment (see below). Squeegee is a must-have tool if you wash your own windows, but useful also for cleaning mirrors and even floors. When hiring a PRO service to clean your home, understand that the best companies—such as MaidPro—will always bring in their own supplies versus presenting you with a list of things to buy. You can be sure PRO solutions are thoroughly vetted and tested, and that cleaning PROs are well trained in how to use their supplies both safely and effectively. What’s more, you can free up a ton of storage space by not stocking your own supplies!